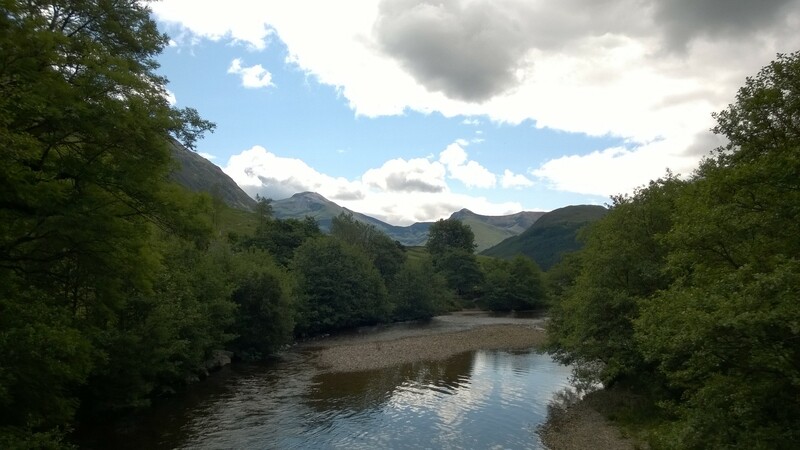 My youngest son, Joe, is off school now for the summer holiday so we decided to take a couple of days together and head up to Fort William. 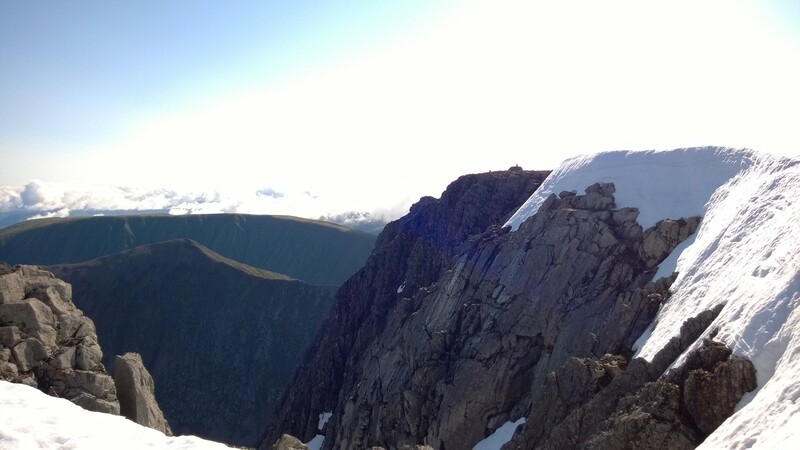 Since he came to live with me in Scotland, Ben Nevis has always been something we’ve spoken about, mainly as about the time he arrived I’d just got a place in the Ben Nevis race. 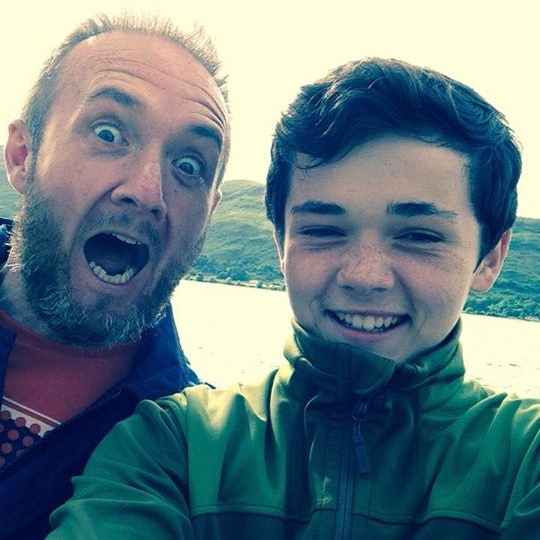 He was amazed that his crazy dad would be running up the highest mountain in the UK. Our plan was to arrive in Fort William on Tuesday afternoon, have dinner in the town, then an early night and make an early morning start up the Ben at about 5am on Wednesday morning. We stayed in the Lime Tree, which turned out to be a lovely little place. Right at the end of the high street, with a great view out over the loch. 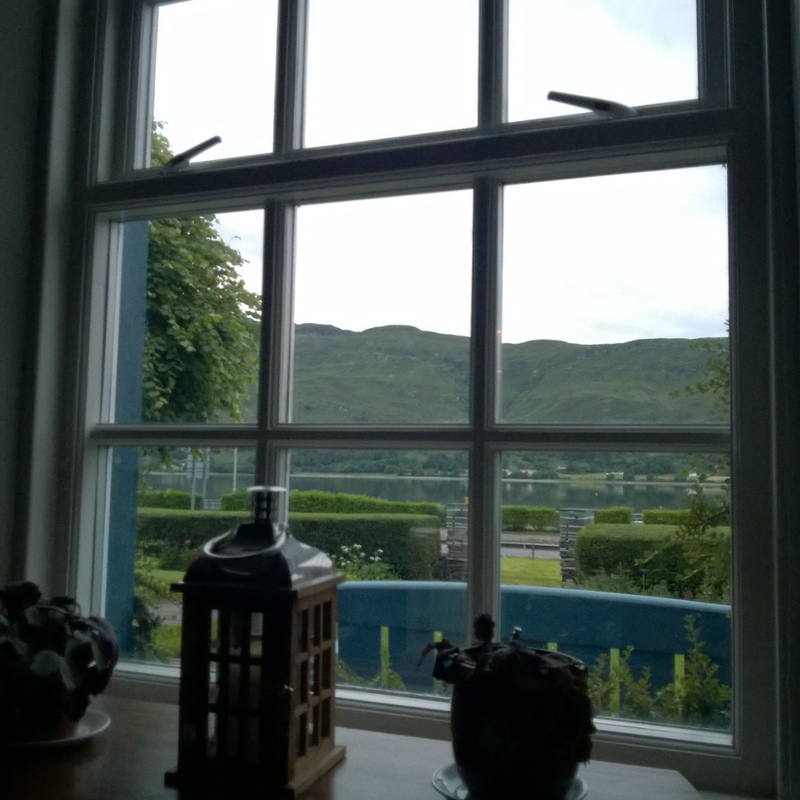 Because we were leaving so early, they offered to leave us a continental breakfast laid out in one of their sitting rooms, so at 4:30 we were sipping orange juice with a view over the calm waters of the loch outside. 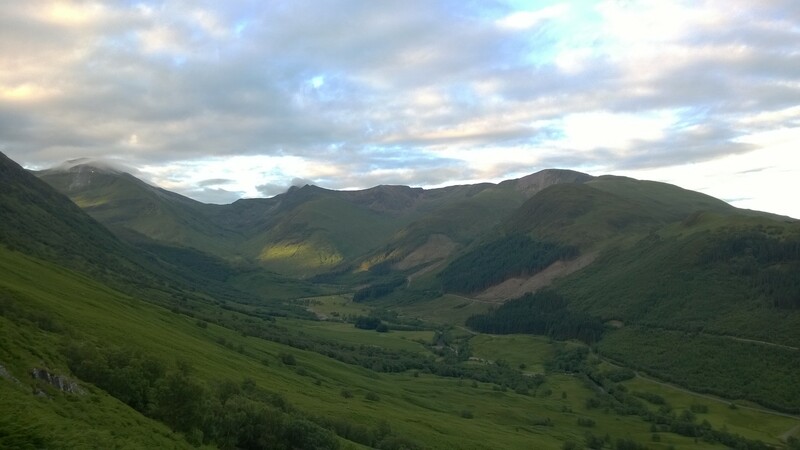 We headed over to the car park at the Glen Nevis visitors centre and made a start on our walk just after 5:30am. The day was beautiful already with the cloud starting to break, barely any wind and a perfect temperature. We were in for a spectacular day. As we started up the mountain track, it felt like we had the entire glen to ourselves, with the sun creeping up over the ben lighting up the scenery perfectly. We set off so early to try to enjoy the peace and quiet of the mountain without the hordes of tourists who set about the place most days. With the weather heading in the direction it was promising too, this was later going to turn into a brilliant decision. The path served us well all the way up and with the exception of stopping to make time for the wonderful views we were being treated to, it was a straight forward climb up to the top. We probably could have done it in about 2 hours, but the views were just so distracting. As we neared the top and looked back, we could see the first waves of people heading up the track behind us. We reached the summit at about 8:30am and took some time to take in the magnificent views again and also check out the snow covered exits to the gullies. What scared me was how many people had walked across the snow cornices at the top of each gully. People seem to have no comprehension for how dangerous this can be, yet you only need to look from the side of the gully to see the certain death that awaits if the snow was to give way. We got the stove out and treated ourselves to a hot chocolate on the top before making the descent back the way we came. Just as we were leaving there were two guys who arrived at the summit wearing shorts and training shoes carrying a Tesco carrier bag. Whilst the weather was fantastic as you can see from the pictures, this struck me as being reckless to be on such an exposed mountain with so little protection. As we left the plateau some cloud manifested for about 10 minutes. The temperature dropped dramatically and I layered up and had to put my gloves on as my fingers were achingly cold. As we descended we passed the 100’s of people heading to the top. I’d heard about the tourists and Ben Nevis, but never experienced it before. It really was quite something seeing so many people heading for the summit and made me so glad we’d made the effort to set off early and enjoy it for ourselves. At the base of the track we bumped into a ranger and had a chat with him. He was saying how they do so much to try to educate people about the dangers of going up the mountain without the right equipment and preparation, but as was obvious, so many people either don’t find it or choose to ignore it. I think they do a great job myself, if you read anything online or in books about Ben Nevis you will always see a warning about being prepared and the potential conditions near the summit. Once we reached the river, we stopped for one final landscape photo on the suspension bridge across to the car park. After dropping our things off and a quick change of clothes, the Ben Nevis inn was just opening for lunch so we decided it would be stupid not to make the most of it. We sat outside eating a Ben Nevis burger each when Finlay Wild came running down off the mountain. Joe was ecstatic as ever since he saw Fin’s youtube video of the Cuillin Ridge record he has idolises the guy. Sadly he missed his chance to get a selfie with his idol, but he was even more blown away to see Finlay run past again a few minutes later heading back up towards the summit. It was a great lesson for Joe in what it takes to work hard to win races and break records. All in all, it was a perfect day out. The weather was exceptional and having the mountain to yourself is beautiful and gives you the chance to really savour the experience.